The new generation of video heads from Sachtler. 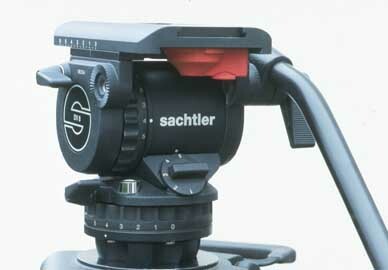 More than fourty years ago the cameraman Wendelin Sachtler founded the Sachtler company. With her high quality, robust, durable and solidly worked products, the Sachtler company has become the world wide leader in this market of professional support for film and television cameras. As far back as 1970 the Sachtler company used carbon fiber in their production of tripods. Compared against Dural Aluminium Tripods, the carbon fiber tripods offer numerous positive aspects. They are lighter and at the same time more solid, the material does not lose its shape and is absolutely free of corrosion. Even by cold temperatures the tripods can be handeled very well and are not so cold to the touch as aluminium tripods. Many large as well as small production companys and camera men/women worldwide place their trust in the newest technologies and first class user comfort along with the dependable service of the Sachtler company. The reliable hydro heads type 10 and 14 are being produced since 1984. This series was modified in 1992 and with the type classification 10/75 and 14/100 delivered. 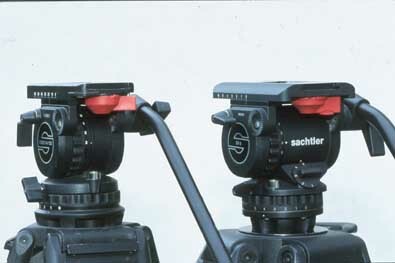 After publishing a rather lengthy test report in FOTOGRAFIE DRAUßEN issue 6/96 on tripods and hydro heads, numerous photographers changed to using Sachtler products. I still receive phonecalls and questions on this detailed and informative test report. For the FOTOKINA 1998 a complete new program of fluid heads was introduced and have been delivered since the beginning of the year. For us wildlife photographers another great step ahead -- the new heads from the DV series. has reached the ultimate in user comfort. The whole width has increased by 3 cm from 7,8 cm to 11 cm, which offers a more stable incliner compared to the predecessor.The balance plates which enable you to to assure a perfect balance on the horizontal are larger and the slide has become longer. Both heads (V8 and DV 12) have a damper in five steps rather than 3 as before which enables you to have super fine camera handling even under extreme conditions. Brand new is the dynamic weight equalizer in five steps ( before there were 3). Torsion springs level out the torque when the camera is tilted. The camera is not able to just tip unexpected but will stay in any position you tip it to. Depending on the size of the telephoto lens, you can choose an individual torque setting. The dynamic weight equalizer will work apart from that independantly and absolutely without service. A great improvement -- and for the photographer a quicker handeling -- is the new touch & go lock. Now when opened, the security lever engages. Then, the moment you place the camera and lens onto the top, it automatically snaps shut. There is no need to have one hand free in order to grip the security lever. The security lever finally has an additonal barrier which makes accidental opening of the lock impossible. A really good and very comfortable solution. Even after placing both hydro heads into the deep freeze at -20° C for more than 48 hours, I was absolutely unable to detect any change in handling. I was able to operate both heads smooth and easy. The dampening operates, according to Sachtler, unimpaired at temperatures between - 40°C and 60°C. I personally tested the dependable 14/100 hydro head at more than 40°C , with best results (FOTOGRAPHIE DRAUßEN issue 6/96) at Yellowstone National Park. The DV8 replaces the presently available 14/100 incliner for us animal and wild life photographers. It is very suitable for focal lengths up to 600mm in combination with the 1,4 or 2 X converters. Those working with heavy viedeo cameras should choose the DV 12. 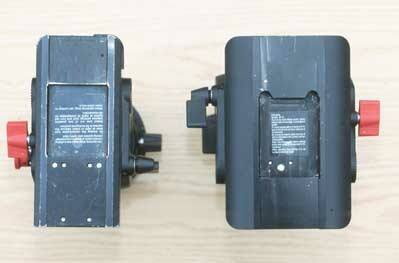 The difference in the two heads is the dynamic weight equalizer. The DV 8 has 5-10Nm/appx. 5-10 Kg and the DV 12 has 7-12Nm/appx. 7-12 Kg. Apart from that, there is a 100mm level and a, by 7cm movable, balance plate on the DV 12, whereas the DV 8 only a 75 cm level and a, by only 6 cm movable balance plate, features. My suggestion: whoever decides to order the DV 12 should ask to have the DV 8 balance plate installed since the balance plate that comes with it features a larger camera plate (Touch and Go 16). Should you decide to order the DV 8, then you should specify to have the 100mm level installed, which enables you to skip the adapter ring between tripod and hydro tilt. I would suggest the new hydro head DV 4 for focal lengths up to 500mm, which is comparable to the old 10/75. It does not feature a dynamic equalizer, only a dampersetting, but has instead a, by 6cm movable, balance plate. With these movable balance plates it is possible to work very efficiently in macro areas and they even partially replace an adjustment sled. If you compare these three hydro heads with automobiles, they would most certainly form the Rolls-Royce class and the prices are accordingly. Starting with the small DV 4 the price starts at appx. DM 2.700,- and leads by way of the DV 8 (with appx. DM 3.600,-) to the DV 12 which ranges at about DM 4.700,-. All prices of course include the VAT. For those readers who do not have the issue 6/96 of FOTOGRAFIE DRAUßEN that features the article of appraisal From the Deepfreeze into the oven available any more: you can find this article on my brand new web site.